A short post as I'm currently trying desperately to write something of my chapter these days (epic fail as of now). There seems to be a general understanding that certain sea creatures are more popular with humans than others. Of course, visitors to aquariums commonly flock to cetaceans- dolphins and whales are all the rage with crowds even though few small aquariums have them. After mammals come the less popular but still exciting toothy exhibits: sharks and piranhas and alligators. Several public aquariums I've visited have feeding times for these carnivores and children especially seem to love to watch these animals feed. To each his own I suppose. After these exciting exhibits, there's a few others that grab attention: pennipeds (if the aquarium has them), penguins (even though the exhibits smell so horrible) and sea horses (everyone's favorite, am I right?). Eh, the fishes are okay- but they are just swimming around- whatever. 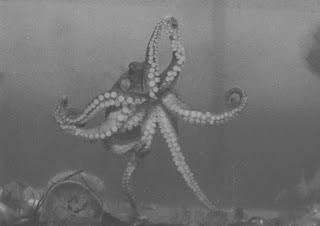 One other marine organism, popular both in public aquariums and in the early 20th photographs I've been studying, is the octopus. The three images I've lined up above were all taken with a stationary camera on a tripod with some sort of illumination (the type changes throughout the time I've covered) from above. All of the images were taken through the glass of an aquarium- the first was taken through a special "photography aquarium" built specifically for photographing marine organisms. The two other photographs were taken through aquarium glass at public aquariums. 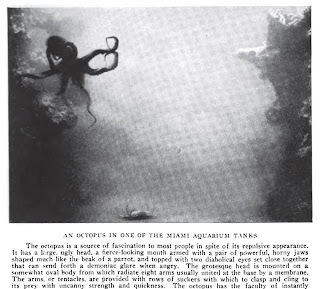 The second photograph was taken by John Oliver La Gorce, a rather famous fellow who was the editor of National Geographic and if you're from Miami, has a whole fancy island (Gorce Island) named after him. He was an explorer when people still got to call themselves explorers and he loved taking photographs. This one was taken at the newly-opened Miami Aquarium and marine laboratory. 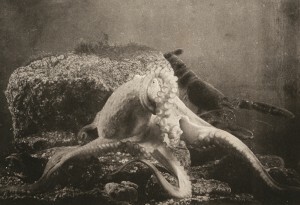 The third photograph was taken at Scripps Institution of Oceanography, although I've got little information on the photograph as I found it in the New York Aquarium papers at the Wildlife Conservation Society archives. Cephalopods are very popular images during this period- as photographers sought to refine the techniques needed to accurately capture marine organisms either underwater or in the aquarium, they often took pictures of organisms that they thought looked "interesting" or "exotic". In addition to an interesting subject to photograph, there's a better reason that there are so many pictures of certain marine organisms during this time: it was a heck of a lot easier to take pictures of things that didn't move quickly. These photographers were taking low light photos- most public aquariums and marine laboratories utilized natural light from overhead to illuminate their buildings. Artificial light was still touch-and-go in some places, and the organisms seemed to respond better to natural light. In addition, many of these creatures are most active at night. These photographers were usually working in aquariums at night after everyone else was gone- just waiting around until they could get a lobster or fish or octopus to turn towards the camera for long enough to try to snap a photo. So, the octopus was a great subject- it was visually striking, seemingly exotic, and still enough to capture on film that might need longer exposure in lower light. There were few other organisms that were as photogenic as the octopus- the lobster, starfish, and molluscs (you can see what looks to be an abalone in the third photo)- but the cephalopods really made such startling subjects. I hope you enjoy the photos- I find them visually striking and they give me something to think about: how do I envision the ocean? Is my image of underwater based mostly on experience, or upon the images presented to me by photographs like those above? The second image, in particular, is haunting! Interesting point about octopi being still enough to capture in low light. Something about their form nevertheless gives a sense of motion, in the way that an abalone does not. Your final point about how we envision the ocean--definitely. Also true of tropical forests. Images accentuate the visual diversity of life presented to the viewer, and also the contrast of light and dark, the sense of scale, but also perhaps claustrophobia. Not that these places can't actually look like such images sometimes.